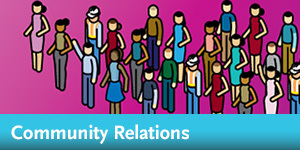 Community Relations is committed to transforming communities, building a constituency for transportation in Los Angeles County and leading the conversation with stakeholder groups now and for future generations through public engagement. Our team is made up of three integrated sections, with each section dependent on the activities completed during previous phases, creating a cradle to grave approach and a seamless customer experience. We recognize the importance of the community engagement process as it relates to transportation needs. We are committed to coordinating communications to identify transportation needs, to inform and educate about projects in construction, and to prepare communities for new Metro service. Members of the Community Relations Team are integrated with portions of the planning, architectural, engineering, construction, operations, and safety departments at Metro. On a given day, the Community Relations Team will present information regarding a transit line in the conceptual planning stages, meet with local businesses or Service Councils and brief on current construction activities, and make presentations at schools to discuss how to be safe around existing and soon-to-open transit service.